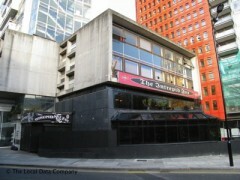 Some say that the Intrepid Fox was a meeting ground for rock and metal fans before there was even a pub on the site. We don’t know about all that but it certainly reels them in now. Regular lager and spirits fuel a banging pub often filled with more big hair and leather than you’d find at an Alice Cooper show. I'd walked past the Intrepid Fox many times and always thought "what a dump" when looking during the daytime. However, I went with a friend and really enjoyed myself. Curious that someone claims that they wouldn't go to a bar if it was the last of places and that thy've been avoiding it should then find themselve there and then write a bad review. One would suspect that if refused service by the manager from the offset that there was possibly some reason in the past to explain that action. As the bar will be moving at the conclusion of it's lease due to the redevelopment of Centre Point it will hopefully be easier for you to avoid. Absolutely terrible! Staff's attitude just stinks. I knew this was the case, so been avoiding this place whenever possible but was in the vicinity yesterday when I decided to pop in for a quick drink. Imagine my surprise when the bar manager refused to serve me without offering an explanation, despite me asking what the reason was. I can only imagine it was because I wasn't wearing poser clothes and was in my office attire. I love metal but if this was the last metal bar on the planet I wouldn't go there!! Improvement? Sack the horrible staff and start caring about your customers! I started drinking at The Intrepid Fox in it's current location in 2009 after being away from London for 12yrs ( I used to drink there at the old location in Soho) The first day I went the bar crew weren't busy as it was a weekday afternoon so we got to chat about music and all. The next time I went it was the weekend and the place was packed and rocking. I was really impressed that the staff I'd already met remembered me and my drink so service was good and quick despite the crowd. I've since become a regular here and love the place, I'm in my 40's and I always have a good time and strike up conversation with people from all over the World and all walks of life. They don't do food & there is a no tie rule but they definitely do shots and attitude. Nasty, grotty and expensive. The only plus points are that it's close to Tottenham Court Road Stn, it's open late and it plays a good range of rock and heavy metal, which is always cool. However, the toilets smell like a morgue and obviously haven't been cleaned since the place opened, and I think the toilets are always a big indication of how much, or in this case how little, a business cares about its customers.